Tony's Kansas City: TKC MUST SEE!!! KANSAS CITY MAYOR CONTENDER STEVE MILLER SENDS DOG-WHISTLE RIGHT-WING MAILER!!! TKC MUST SEE!!! 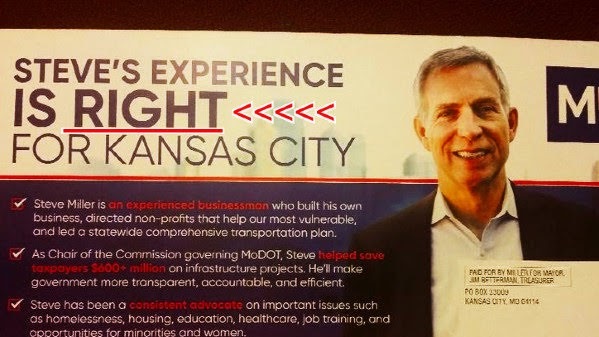 KANSAS CITY MAYOR CONTENDER STEVE MILLER SENDS DOG-WHISTLE RIGHT-WING MAILER!!! Steve Miller is playing catch up in the mail-game that most consultants mistakenly sell to politicos as a missing-piece for every campaign. Again and again we're forced to remind politicos that people almost never read junk mail and toss it without a glimpse . . . Not even the 5 seconds consultants promise. Rumor has it that Miller is a client of the local GOP powerhouse AXIOM firm but the reality is that every leading candidate for Mayor in KCMO has already taken a meeting to kiss Jeff Roe's ring and exchange pleasantries. More important than gossip is Steve Miller playing both sides of the fence . . . HYPING HIS FRIENDSHIP THE HILLARY CLINTON TICKET AND THEN PROMISING HOME OWNERS THAT HE IS "RIGHT" FOR THE JOB IS A NEAT TRICK WHICH BASICALLY DEMONSTRATES THE BIZ DUDE DOESN'T REALLY BELIEVE IN MUCH!!! The Steve Miller meetup with Senator Tim Kaine was equally insulting inasmuch as local voters have never shown much love for endorsements . . . Especially from b-list political losers who don't have much, if any, pull locally. Sadly, all caps "RIGHT" wing promises won't impress voters who don't really know much about the guy except for his effort to run a campaign mostly based on his otherwise impressive image, connections and career but with very little substance for Kansas City voters. Still probably a better candidate than Jolie. Clay Chastain's missing bro? Or an alternate reality where Clay decided to go to law school instead of getting petitions signed. Northland seems to like him. He'll finish 4th or 5th but only because scott wagner isn't sinking any real money into his campaign. Dude doesn't have a chance. Just take a look at his face. Sounds like this guy is a phony. He's a democrat trying to reach out to the republicans in KC. I don't think that's going to work for him we are way to divided now. I couldn't bring myself to vote four years ago because there were no competent candidates on the ballot. Thus far, this year will be no different. Plow the streets, fix the potholes, pick up the trash, and don't spend our money bribing grifters to locate their businesses (or real estate dreams) here. You mean the Sly James versus Vincent Lee contest? Bleach! It's what food craves! Looking forward to the day when I can buy a mega yacht. Damn slow and boring news day. All the killers get the night off last night? Steve Miller? I liked "Fly Like An Eagle" and "Take The Money And Run", but "Abracadabra" not so much. With the Tim Kaine endorsement it will surely out him to the general public. He is no better than the Kansas witches that ran as republicans then switched parties after the election. Run this asswipe put of town as fast as you can! This article is ridiculous. Sending a mailer highlighting his very impressive legal career is hardly a far right dog whistle. Would you prefer people run for mail based solely on emotional appeals rather than experience? If you look into his background his record on social justice is outstanding, he is a devoted ally of many worthwhile and meaningful social causes. If you want to know his background look at his law firm website for more information.I don't think he's hiding anything. He should hype his experience with transportation and infrastructure. It's hinted on in that piece. Agree glossy mailers are generally a waste. But muni voters are usually more civic minded and may actually read political mailing at least in a non presidential election cycle. So for them why not give them some things to actually read. The article is way off base. And 8:11 you do not know what you are talking about. Miller is being endorsed by Tim Kaine who is anything but a conservative. Miller is smart which is something we do not have too much of in the City leadership today. He is also a proven problem solver. I would venture to say he would not try to solve the Crime problem in KC by reducing the police force. The guy has my support 100% and the city could use a guy like this as the Mayor. I do not think Miller has a chance but it is interesting what platforms candidates take when they are not being ordered upon them from a national party. More than a few candidates for Mayor have views that cover both sides of the liberal/conservative spectrum, socially and fiscally. Sly is a perfect example. He is a black Republican who doesn't like guns. His performance could never get him elected on a state/federal Dem ticket. Well maybe 15,000 voters will turnout for this one you never know. State Highway, and shifted cost to KCMO taxpayers!!!! Never Miller!! I bet the Russians are colluding with local republicans to ensure a KCMO gets a GOP mayor in an upset victory. How much do you think Axiom is charging him? I'm guessing they're cleaning out that bank account pretty quickly. Also, since the reduction of the Police force has worked so well, why not reduce it even more. This would help fund new grocery stores on the east side, the sinage for the MLK project not to mention the cost for the various 18th and vine projects and Employee overhead costs.